While commonly executed within external service provider relationships, Service Level Agreements, or SLAs, can be leveraged internally between departments to establish expectations for sales and marketing alignment. This tool is particularly effective at aligning marketing and sales team when implemented thoughtfully. If you've ever made the mistake of grabbing the shopping cart with a bum wheel, this should be a no brainer. Without a doubt, you can navigate your way around the store meeting all your objectives in significantly less time when all four wheels work together in sync. The same is true of teams tasked with generating revenue. When everybody is on the same page, businesses hit their goals more consistently and in less time. Too often, I see a breakdown between sales and marketing (I'm positive I'm not the only one). Typically, it's because one team has primarily led the charge in setting goals, creating processes, and determining the definitions that power the revenue generating system. Then, this information isn't communicated clearly to the other team. The result? Both teams end up sort of floundering in their own efforts/assumptions about the common objectives and what they're responsible for in terms of production. So, how do you get started? 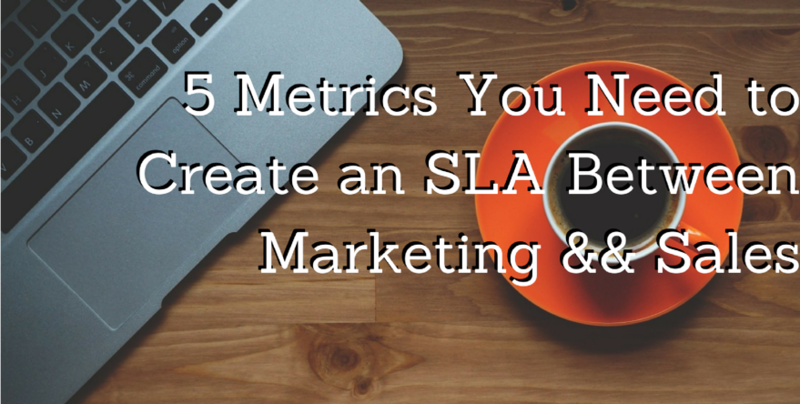 Where do you even begin when you want to build out the SLA for your teams? Check out the following five metrics that will get you going in the right direction. If you're not able to collect some of these numbers, try to come up with your best ballpark estimate of what they might be. It will be better to start with something than to have a bunch of blank spots. And in this case, you'll start to establish your baseline metrics and use those to refine as you revisit your SLA each period. Now that you've tracked down the key metrics upon which you'll build out your SLA, what's next? 1. Get a meeting with the sales and marketing teams on the calendar. If your teams are large, determine who will serve as the ambassadors for each team. It can be tough to coordinate a time that will work for everybody, so give yourself plenty of time to sort through the logistics. If you're trying to have something in place by a certain date, work backward to figure out when you need to start. It's also important to make sure to set the expectations properly. The individuals joining the initial meeting need to understand its importance and intent. Without the proper context and paradigm, their ability to contribute productively will be hindered significantly. 2. Draft the agenda (it will be incredibly easy to veer off-course throughout the conversation; be sure to outline the key points that HAVE to be addressed). Identify key roles within the committee - who is responsible for what? What could cause this to fail? What are the consequences of failure? Establish safeguards against any noted scenarios. This will be an instant PMA (positive mental attitude) boost going into the meeting; you're going to get into the nitty gritty minutia during this discussion and people will be able to maintain higher spirits and contribute more if they're happy at the start. 1. 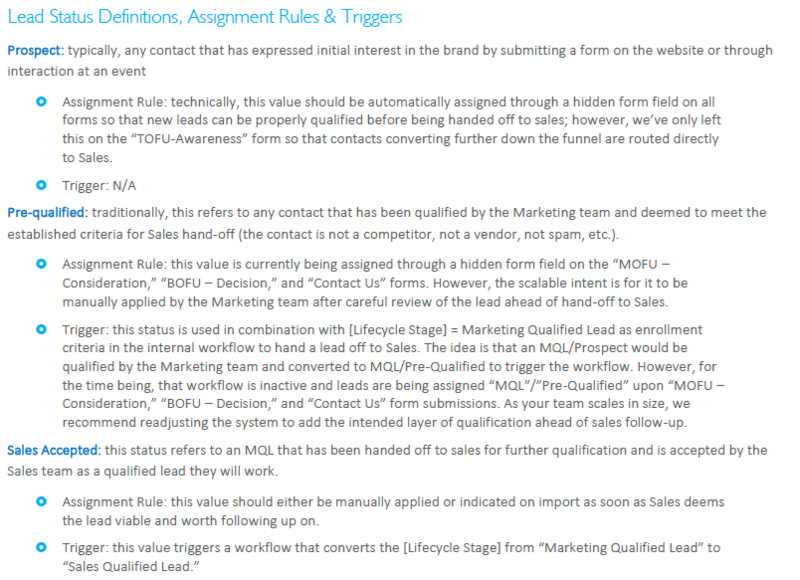 Definitions for lead types, statuses, and lifecycle stages along with triggers/actions for each. It's important for everybody to have a firm grasp of what constitutes a Lead, Marketing Qualified Lead, and Sales Qualified Lead as well as how those values are set. Is the value applied to a contact's record using a hidden form field upon submission? Is a workflow used to set the property? It's also important for everybody on both teams to understand how the different fields play a role in the system. For instance, if the Sales team is primarily concerned with updating the CRM "Lead Status" field, and those values are used as triggers for other actions in the system, the Sales team needs to understand their impact and responsibility. 2. Documented lead management protocols for both marketing and sales with clear processes for nurturing, hand-off, and follow-up. Again, it is critical for each contributing team member to understand exactly what they are responsible for and what is expected of them. When someone isn't properly trained or doesn't follow through with their duties, leads can slip through the cracks and opportunities will be missed. When a lead converts on a top-of-the-funnel form, what is/are the process(es) for nurturing them to the point of hand-off to sales? Who is responsible for lead nurturing? 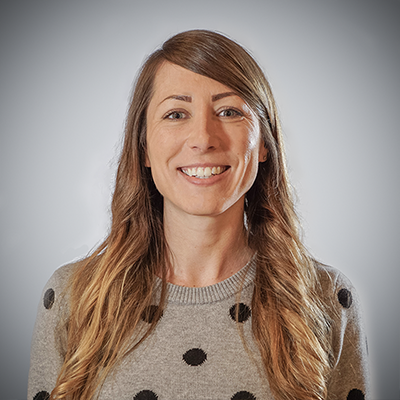 When a marketing qualified lead has been handed off to sales for evaluating and further qualification, what happens if the sales team member rejects that lead? Is it enrolled into a workflow for further nurturing? Is it deleted from the database? When a sales qualified lead converts into an opportunity that eventually stalls out mid-cycle, what happens? Who is responsible for kickstarting that opportunity and by what mechanism? If your team hasn't accounted for these scenarios or those that could be similar, your process is inevitably going to have gaps. And gaps often lead to unnecessary confusion and fumbled leads. 3. Clearly defined SMART goals for both sales and marketing. This part should outline exactly what each team agrees is a reasonable amount of production to support the organization's goals. Using the metrics you and your team tracked down and prepared ahead of time, you should be able to figure out how many leads and marketing qualified leads need to be generated in order to fill sales' pipeline with enough prospects and opportunities to close into customers. If either team doesn't hold up their end of the bargain, it'll be important to figure out where the system breakdown is occurring (not in an effort to place blame and point fingers, but rather to address the issue and keep the organization on track for hitting revenue goals). Following the order of operations, you should divide your revenue goal by the result of dividing the average LTV by the average length of customer engagement. Next, divide that number by your average lead-to-customer rate (as a decimal). 4. A way to measure your teams' progress to the established goals. The "M" in SMART stands for "measurable." It will be important for your teams to have access to a shared dashboard that tracks the metrics each team agreed to hold themselves accountable for. Additionally, it's nice if you can track the bottom line outcomes of those metrics to see how marketing and sales strategies support important revenue and/or profit goals. The SLA is a perfect place to establish where that dashboard will be, how it will be populated with data, and who will be responsible for making any necessary updates to it. 5. An evaluation roadmap that lays out how often your teams will review what's in place to identify opportunities for improvement and celebrate the pieces that have been successful. It is imperative to remember that this isn't a set-it-and-forget-it plan. While there may be times that you re-visit this agreement out of necessity (something in the system is broken and needs to be resolved immediately, for example), there should also be a pointed effort to regroup and discuss ways to fine-tune the system. It's obviously also a great time to look at what's working, celebrate it, and figure out if there's a way to replicate it in other areas of your system. Get an SLA in place ASAP! Here's the thing - both teams will benefit from having an agreement in place. And when the sales and marketing teams are in sync, the organization will be more likely be more successful. Plus, everybody will have more fun. It's important to keep that in mind to prevent folks from just going through the motions of the exercise. An SLA can and will make a difference - as such, each step in creating that agreement should be thoughtfully considered and carefully executed. If you're not sure where to get started, give us a call and we can give you some ideas!